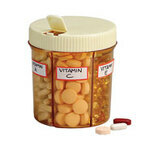 6-section pill organizer consolidates vitamins and other daily medications. Has roomy compartments and eliminates the need to tote around multiple, hard-to-open bottles. Plastic pill dispenser organizer is 4" H.